We bring forth exclusive Cup Anemometer for our esteemed clients. Our electrical signaling Cup Anemometer helps to determine the wind velocity complete with flashlight unit, electric lead instructions with counter. 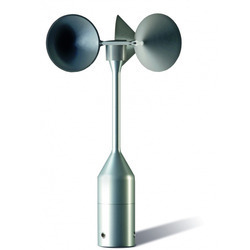 These Cup Anemometers are procured from the leading brands and are assured for long term usage. We are offering an excellent range of superior quality Anemometer Cup Counter to our clients. 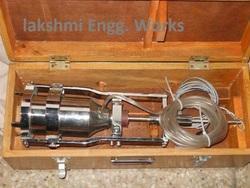 It is manufactured as per IS : 5912 : 1970 for measuring wind velocity. This instrument measures total run of wind passing at the point of observation through Mechanical Counter of the range 0 to 9999.9 km. The Anemometer – Cup used for measuring the wind speed. The instrument has a Cup wheel comprising of three Conical cups with bedded edges and free to rotate in a horizontal plane. The Cup wheel spindle is connected by worm gearing to a revolution counter mounted inside a water proof housing. - Cup Anemometer, Barometer, Humidity, Temperature meter, 4 in one, professional. - Barometer unit : hPa, mmHg, inHg. - Anemometer unit m/S, Km/h, FPM, mph, Knot. - Barometer unit hPa, mmHg, inHg. Wind Speed Transmitter Compact is available with the following output. Display: 3 - 1/2 Digit L.C.D.